You might have noticed in my last posts that I used 120 pieces of recycled 18650 lithium cells alongside with 4S Lipo pack to power my ebike. This introduces large variance in terms of practical charge capacity and coulometric efficiency. As the result, charging them all in series configuration (14S pack) can be very challenging because each individual cell accepts charge at a different rate, meaning, all 14S will sit at different voltage levels. The issue arises when at least one of them reached overvoltage condition. For my case, anything above 4.2V per cell is deemed to be very dangerous as it might explode and catch on fire. The tragedy happened to me once before (fault charger) and I learned the hard way to respect the voltage limit. 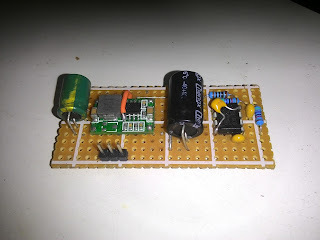 I then constructed a passive battery balancer which was TL431-based shunt regulator (refer to my Hackaday link below). It works fine and dandy, but, the shunt transistor overheats pretty much all of the time. Dissipating 300mA as the balancing current at 4.2V (that's 1.26W) proven to be stressful for the design. Not to mention the fact the balancer needs all cells in the pack to reached 4.2V before the actual balancing can be performed (this is commonly called as top-balancing). Googling for an active balancer solution lead me to expensive proprietary solutions that I cannot afford at the moment. Hence, I decided to give it a go by designing it myself using low cost parts. The principle is quite straight forward really. All I did was converting the synchronous buck converter module (MP2307) to become a voltage follower (look at R4 and R5). In this case, the voltage that it is following is the half of the battery voltage. In theory, I can make the power converter module to follow any voltage that I want (within limits of course). 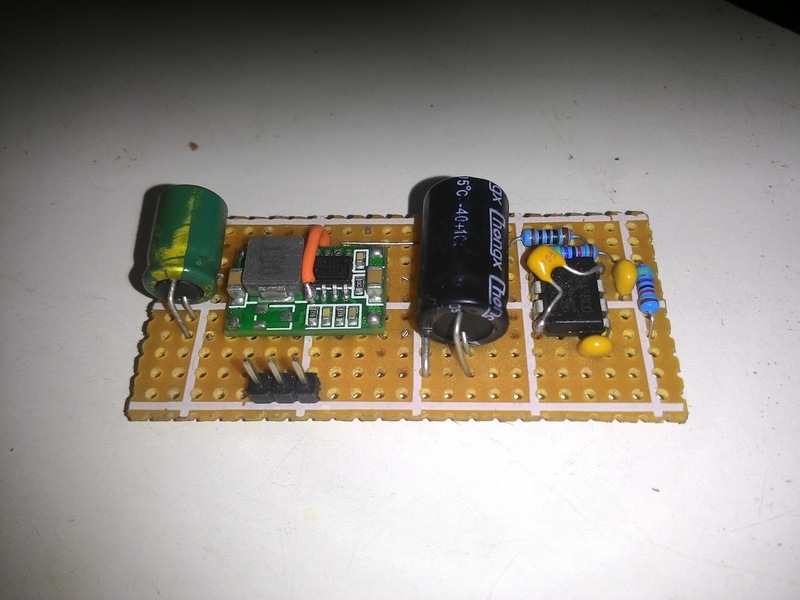 This is a very simple way of modifying the voltage regulator to instead of having the voltage to be set by an internal voltage reference (0.925V in this case) and a resistor-network, this technique forces the chip to follow an external voltage reference instead. In other words, the circuit forces the voltage regulation to be governed by an external voltage reference, instead of the internal one. The circuit constructed on a perfboard. I originally intent to manufacture and sell on it Tindie, but, before I do that, I thought it would be nice to have a review by a friend of mine in the community (Vanarian from Endless-Sphere). Unfortunately, the board that I posted to him in France was lost during shipment and the board does not reach to him. I lost my motivation and decided to open source this instead with the hope that the community can benefit from it and made some enhancement to it. The design files can be found in the links below. I am seeking an active balancer for my companies products, BatteryBlocs. I would be interested in supporting this project financially and working with you to achieve a modular active balancing board. It is a superior concept to my Balance Blocs. But, I only have weekends to work on my hobby projects, so, I don't think I can finalise the design within 2 months. As for now, feel free to use current circuit. A small mention of me would be appreciated. I love the simplicity of the analogue circuit. Did you try the circuit on more than two cells by any chance? What was the quiescent current like? I could get these manufactured easily in china cheaply. Do you think these could be made for less? If so, I would like to join you in making a trial batch in China- maybe by Seeed- if Afdhal supports this. No, I only tested it on 2S-cell. I did test the quiescent current, but I lost the log file. Feel free to manufacture it. Thank you for the link, that is one interesting product indeed. I wonder what topology they used. My version can be made for under $3 per cell, maybe Anthony can make it cheaper? Are you still working on this? When I look at your KiCad schematic I see four separate circuits. I don't see how they fit together. (I'm not good at this) I have someone who will draw the PCB if I can get him a good schematic. Can you help? As always, I understand your time is valuable and am happy to pay you for it. The 4 circuits you mentioned is connected via the node names. For example, all nodes named VCOM are connected together. I plan to restart this project in 4 weeks, I'll let you know if I have any updates. Ahh, that makes sense, connect the nodes. Happy to hear you are still interested. Do you have ideas for improvement? There is a real need for a low cost modular balancer. My goal is to build one into each BatteryBloc so DIY people can assemble batteries like Legos. I would be happy to see an open source schematic. I would make them and sell them with my BatteryBlocs, and at the same time have links to the schematic for the DIY people. The best on the market are from Deligreen and cost $21 each: I believe they use flyback topology. The product needs to be as efficient as possible, balancing accuracy is less important. .05 of a volt difference could be the limit. Let me know if I can help your effort with funding. How fast does it need to be? With current design, 50mV will take days. Flyback topology might solve this, but, I'm not sure about the BOM cost yet.